"Six aliens stranded across the galaxy must learn to work together"
Starship Epiphany is an experimental long-range science vessel. When a test trip goes wrong a skeleton crew of six unique individuals find themselves stranded impossibly far from familiar worlds. They must learn to understand each other's differences and strengths if they ever hope to find their way home. Starship Epiphany has not been tagged yet. 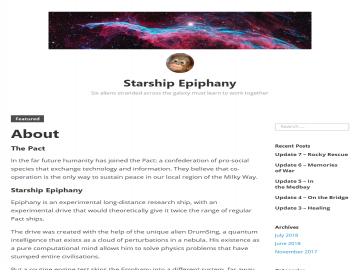 Help others find Starship Epiphany by tagging it! Starship Epiphany has not been reviewed yet. Starship Epiphany has not been recommended yet.